I-81 to Whitney Point, NY. Route 89 up the west shore of Lake Cayuga and over to Syracuse. 7/31 Ottawa to Ogdensburg via 416. Hwy 68 to Colton. Hwy 56 south to Hwy 3. 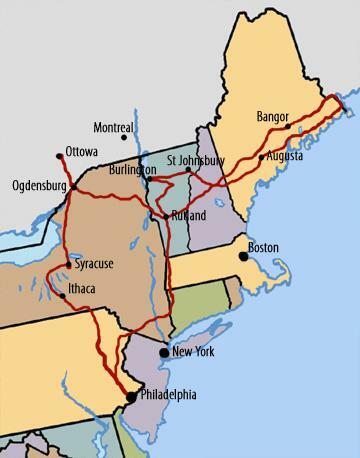 Then rte 86, 35 & 73 to Keene (NY). 9N to Hwy 22. Then Hwy 4 to Rutland and Hwy 7 to Middlebury. 8/1 Middlebury to St. Johnsbury via Montpelier, the smallest state capitol in the US, Watertown (Ben & Jerry's Ice Cream factory!!) and Burlington. 8/2 I-93 to Rte 302 to Rte 117 in Maine. Then it's 202 through Augusta picking up Rte 3 up to Ellsworth. 8/3 Bar Harbor up the coast to Eastport (furthest eastern point in the US) and back around to Bangor. 8/4 Bangor, Maine to White River Junction, VT. via some very pretty back roads. 8/6 Head south for Philly.